Our board is a group of seven volunteers chosen by the Washington Parish Council to help improve and create recreational opportunities for people of all ages in District #1. Here you can find a list of board members, minutes of our meetings, our meeting agendas, bylaws and more. 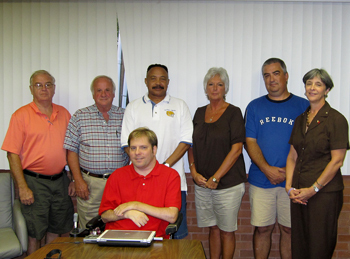 Our board has regular meetings on the first Tuesday of each month at 6:30 PM at Franklinton Town Hall. All meetings are open to the public. If you have any questions, suggestions or comments, feel free to contact us at (985-839-6562) or e-mail at jd67@bellsouth.net. We look forward to making District #1 a better, healthier place with more recreational opportunities for everyone. It is the mission of the Washington Parish Recreation District #1 to develop and maintain quality parks and facilities; to create recreational opportunities for growth and enhancement by developing diverse services and programs that promote citizen involvement and a strong sense of community while striving to increase the social, cultural, and physical well-being of its residents and visitors. The Washington Parish Council duly adopted Ordinance No. 09-488 at its meeting on May 11, 2009, which was offered and moved for adoption by Councilman Posey. This Ordinance created Washington Parish Recreation District #1 under the provisions of the State of Louisiana enabling legislation authorizing the creation of Recreation Districts. The boundaries of this district are included in Ordinance No. 09-488. The Washington Parish Recreation District #1 shall have all rights and privileges granted and conferred by the Constitution and statutes of the State of Louisiana. 1.1 The role of the Washington Parish Recreation District #1 Board of Commissioners is to engage in activities that would promote recreation and any related activity designed to encourage recreation and promote the general health and well being of all persons in Recreation District #1.
a) Adopt a set of bylaws. b) Review and/or recommend policies and procedures that encompass recreational activities and facilities. c) Review the utilization of facilities and make recommendations regarding lease, acquisition, sale, design, improvement, maintenance, operations and scheduling of facilities/equipment. d) Review policies and make recommendations regarding fees, services, charges, and fines related to program activities, facilities and equipment. e) Research grants/funding of recreational programs and facilities. f) Establish recreational activities and programs. g) To perform any other related duties as directed by the Washington Parish Council. 2.1 The Washington Parish Recreation District #1 Board of Commissioners shall consist of seven (7) voting members. Recreation District #1 shall be governed by a board of seven (7) commissioners who shall be qualified voters and residents of the area covered by the district. The Washington Parish Recreation District #1 will divide the initial Commissioners as follows: 1 member for one (1) year, 2 members for two (2) years, 2 members for three (3) years, 1 member for four (4) years and one member for five (5) year terms. 2.2 If a vacancy should occur on the Washington Parish Recreation District #1 for any reason, the Washington Parish Councilmen of District #1 and Parish President shall appoint a replacement to fill the vacant seat. 2.3 Any board member missing three (3) consecutive board meetings may be voted off the board by the District #1 Board of Commissioners and replaced by the Washington Parish Councilmen of District #1 and the Parish President. 2.4 Any board member who is unable to attend a scheduled meeting must notify the Chairman or Vice-Chairman before the scheduled meeting takes place. 3.1 The Washington Parish Recreation District #1 Board of Commissioners shall elect a Chairman, a Vice-Chairman and a Secretary/Treasurer. 3.2 The Chairman shall preside over the meetings of the Washington Parish Recreation District #1 Board of Commissioners and appoint all standing and temporary committees. 3.3 The Vice-Chairman shall serve as a temporary chairman in the absence of the Chairman. In the event that both the Chairman and the Vice-Chairman are absent a temporary Chairman shall be elected to conduct that meeting and proceed with the order of business. 3.4 The Secretary/Treasurer shall, in concurrence with the Chairman, prepare agendas for all meetings, prepare the minutes of all meetings, provide public notice of scheduled meetings, and perform other duties as necessary. He/she is also responsible for handling all financial issues of Recreation District #1. 3.5 Length of term for elected officers shall be one (1) year. 4.1 Regular meetings shall be held on the first Tuesday of each month at 6:30 P.M. at the Franklinton Town Hall. Members shall be notified. 4.2 All regular meetings of the Washington Parish Recreation District #1 Board of Directors shall be open to the public. 4.3 Four (4) voting members of the District #1 Board of Commissioners shall constitute a quorum. A quorum shall be present before any business is transacted. 4.4 All actions of the Washington Parish Recreation District #1 Board of Commissioners shall be put before its members in the form of a motion, duly seconded, and voted upon by commission members present. 4.5 The Chairman shall vote only in case of a tie and instances where there are only four (4) other voting members present. 4.6 The Washington Parish Recreation District #1 shall keep a record of its meetings, recommendations, findings and determinations. These records shall be public and maintained in the files of the Washington Parish Recreation District #1 and at the office of the Parish Government. 5.2 Items of business at the regular meeting shall appear on the agenda. All items on the agenda shall be presented to the secretary at least three (3) business days prior to the meeting. The Washington Parish Recreation District #1 Board of Commissioners may amend the agenda at the meeting. 5.3 Public participation will be limited to three (3) minutes per presenter. 6.1 Bylaws of the Washington Parish Recreation District #1 shall be adopted by a majority vote of the Board of Commissioners. 6.2 Bylaws of the Washington Parish Recreation District #1 may be amended from time to time by majority vote of the Board of Commissioners at a duly constituted meeting provided that such proposed amendment shall have been first submitted to all its members prior to the meeting at which the vote is taken. 7.1 All funds will be subject to the Washington Parish Government annual audit.